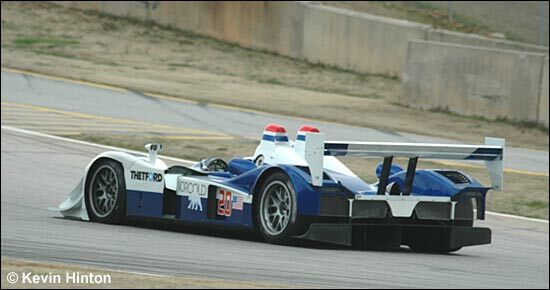 Road Atlanta, Braselton, Georgia, USA – Dyson Racing Team continued to run its new (the second chassis) Lola B06/10 LMP1 on Thursday (March 2), the second day of a three day test at Road Atlanta (not Texas, as was tentatively the plan as of the second Sebring test). 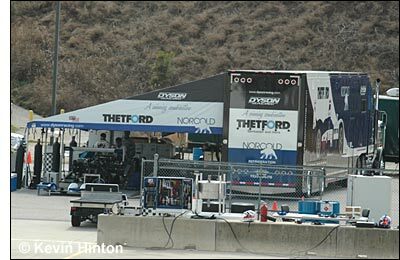 The team left New York on Monday, and arriving at the track to prepare the newly-delivered car: this Lola will become the team’s #20 entry at Sebring and beyond. It had been decided after the January test at Sebring that Lola would incorporate the changes arising from that first test, rather than have the team do so “in the field.” The result so far has been a trouble-free outing that put on 250 miles of track time on day one, and was running on schedule through a planned program into the afternoon of Thursday. Our reporter described the AER twin turbo as a “great sounding engine,” while Guy Smith, testing with Chris Dyson this week (Guy will partner Chris throughout the American Le Mans Series schedule in 2006), compared the sound to an Audi R8. Thursday late morning, Chris was testing damper settings in an out-lap, two flying laps, and an in-lap – then adjust and go again – sequence. Lap times in the morning were around 1:12.9, comparable to the Wednesday “test day” immediately before PLM last fall (JJ Lehto and Marco Werner’s 1:12.650 was the fast time, and the only time under 1:13.). We’re told that the changes since the February test at Sebring have put the car’s ride height back in the aerodynamic “window.” Guy Smith pointed to “more downforce and better grip” as the most significant difference from the team’s B01/60 Lola, which Smith drove with Dyson at Sebring last year. The team reports that they are now working to reduce that downforce and drag so that they can increase straight line speed – the usual “balancing act” critical to proper set-up of these prototypes. The AER turbo installed for this test had four hours of dynamometer time in England before this test and continued to run flawlessly. Guy Smith was back in the Lola by early afternoon as the team began longer runs, in part to begin testing tire wear characteristics. 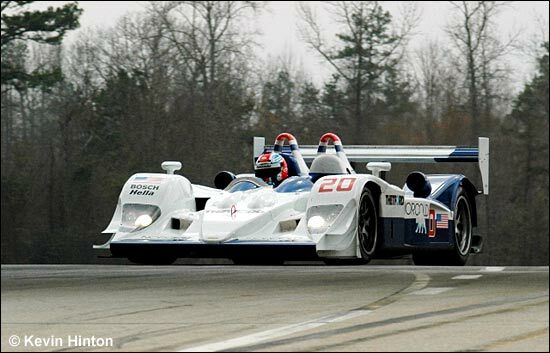 These are the first images of a Dyson Racing B06/10 in 2006 livery. Guy Smith happened to be at the wheel while Kevin Hinton was trackside.